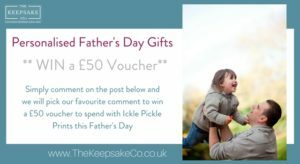 Thanks for requesting your free keepsake gift – it should be winging it to your inbox as you read this… but before you dash off we have another little surprise for you. We know just how hard it is being a parent, and how much these little darlings can cost us so we want to help you capture even more memories with our special keepsake voucher pack. So whether you are going to treat yourself OR buy as a new baby gift for a friend (they will be amazed at your generosity as they will NEVER know how much it cost you!) then all you need to do is act NOW so you can grab our voucher pack (selling for £20 on our website here) for LESS THAN HALF PRICE (i.e. £7) and is actually worth well over £50. Simply use the code “voucher7” when purchasing our voucher pack HERE and we will deduct £13 from your order. So if you love a bargain then hop over and secure your pack today before we change our mind!